Last Friday night, I was super excited to take Dan on his first trip to The Hollywood Bowl. I was even more excited that we bought last minute tickets for Brad Paisley's Crushin' It World Tour. Many years ago, I saw Paisley at The Staples Center and I've been dying to see him again. He puts on a phenomenal show. Parking is never easy at the bowl. We parked at the Los Angeles Zoo and spent twelve dollars for two round trip bus tickets. Dan said that he felt like he was on a "Prison Bus." I told him to refrain from judgement until after the concert. In my experience, the zoo shuttle is always easy-peasy on the trip to the bowl and a nightmare coming back. Sure enough, we were in a mob leaving and herded on the bus like cattle, where we stood up for the ride back. That said, it's probably the easiest and cheapest option. We arrived all smiles and ready for the concert. My favorite part of the night was running into a Judy. I had not seen Judy in an embarrassing number of years and she wins for the giving the best hugs. We had seats in the Terrace boxes. These were the best seats that I've ever had for any show at the bowl. Unfortunately, we bought our tickets so last minute, that we couldn't take advantage of ordering dinner to our box. That would have been a worthy splurge. The boxes did come with a table that attaches to the side and even though it was a little unstable, it was nicer than having to eat our food on our laps, like I normally do in the bench seats. We did take advantage of the servers when they came around with beer during the concert, which was only twelve dollars. If we had to leave the show, we wouldn't have bought more beer. They made it super convenient. I have no idea what we were drinking, but we were at a country concert, so it didn't much matter! Our boxes held four people, but no one showed up to take the two seats behind us. We were entertained and annoyed by the "show" going on in the box directly in front of us. Two very young and very drunk girls showed up. One looked a lot like Amber Portwood from Teen Mom and the other was a super skinny blonde with a big chin. They both wore tight, skimpy dresses and heels, which they couldn't properly walk in. They messily ate a pile of food and then the Amber clone left and came back with two guys. They were Los Angeles frat boy types, but dressed redneck-ish with trucker caps, a really hideous American flag button down. The boys were loud and high-fiving. We quickly caught on that the girls had snuck the guys in to use the other two seats in their box, but that they were all strangers. The super loud guy of the pair started calling his other friends on his cell, making plans for them to "hop a fence", telling them that they had a spot for them in our section. The only spot was empty seats in our box. The kid tried to sweet talk us into giving him our tickets to sneak his friends in. No go. In front of us, the guys spent the entire concert feeling up the girls and making out. The girls split before the encore and the guys went chasing after them, having clearly been ditched. The first opener was a female singer named Mickey Guyton. She has a beautiful voice, but her songs all sounded similar. The only song that I recognized was her ballad, Better Than You Left Me. She began to cry while she was singing and rushed off of the stage. Justin Moore was the other opener. I recognized about half of his songs. Good stuff. He dedicated If Heaven Wasn't So Far Away to his grandfather and he had everyone use their cell phones to make the bowl glitter. It was far more spectacular than any picture can do it justice. Like Mickey, Justin was completely overwhelmed with emotion before he left the stage. Playing such an incredible and enormous venue to a sold-out show, must be overwhelming. Finally Brad took the stage. He started the show with River Bank, revealing a set that included a working bar with patrons and a giant video screen to change the theme for each song. There was a hunting lodge for I'm Still a Guy, during which he was joined by Justin Moore. Mickey Guyton joined him for Whiskey Lullaby. He did a virtual duet with Carrie Underwood, pre-done, not live, for Remind Me. A fun surprise came when he pulled two kids on stage to play Mario Kart on the big screen, while he created a very frantic soundtrack on the guitar. He gave away his hat, an autographed guitar and for a few songs, he walked to a small stage in middle of the bowl, so those in the back could have a better view. I've seen this done in a few concerts ( Keith Urban, Taylor Swift) and it's always a cool gesture for the fans. My only disappointment in the show was self-imposed. On Brad Paisley's Facebook, he mentioned surprises for the show. Since I live in Los Angeles and it happens a lot at concerts, I thought that he was teasing a surprise guest appearance by another artist. I anticipated it the entire evening and when it didn't happen, I was mildly let down. ******I STAND CORRECTED****** - I have a quick revision to my original post and my paragraph above. When my review went live this morning, a reader on Twitter wrote to me, to let me know that the surprise that Brad posted, was actually the two comedians that came on stage to entertain us between the opening acts. I can't believe that I forgot to post about them, as they were both extremely funny and a quirky addition to a concert. Sarah Tiana and Jon Reep, each did a short set, hilarious, both of them. They were definitely a great surprise and a unique addition to Brad's show. Look them up and catch their shows. Good stuff. 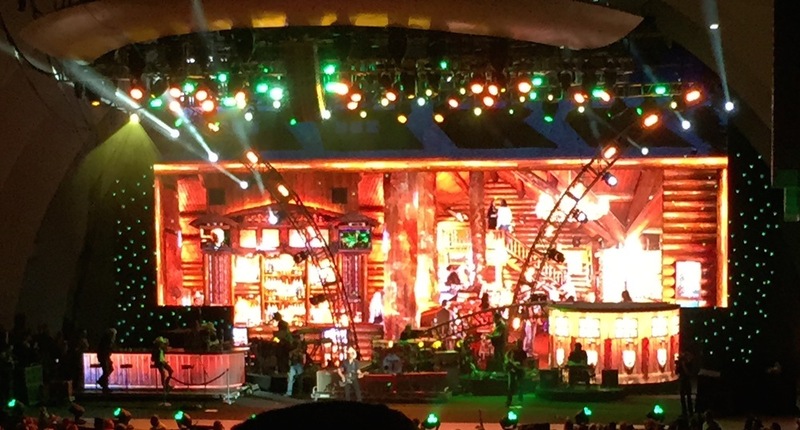 Paisley filled his show with energy and played over twenty songs, all hits. I look forward to catching his concert the next time he comes to Los Angeles. Also, sitting in a box was the way to do the bowl. Now that I know the difference, I will splurge more often.